A lot of gamers feel the same way about Carmack’s past work. He’s the co-founder of id Software and the genius behind some of the biggest titles in gaming, including Doom, Quake, Wolfenstein 3-D and many others. His engines have been used to create other award winning titles such as Half-Life, Call of Duty, and Medal of Honor. But recently, his considerable developing talents have been focused on the iPhone platform. In many ways, this is a homecoming for Carmack—some of his earliest and best work was on the old Apple II. Still, since that initial success, Carmack has returned to the Apple platform only sporadically, including a period of development for Quake 3 and when OS X first launched. The relationship between Carmack an Apple has always been a bit tumultuous, as the developer has often criticized the company for its gaming support. But Carmack took an immediate liking to the iPhone platform, after testing ports in what began as a casual project to satisfy his curiosity. When tinkering with some early ports, he says that he realized: “Hey, this is easy and fun.” A new venture was beginning. 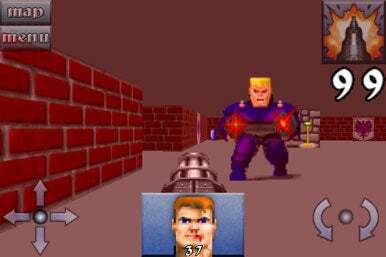 Wolfenstein Classic was the first game Carmack ported over to the iPhone. The process taught him a lot about making games for the new platform. Thus, the first title developed from scratch for the iPhone, Doom Resurrection, was not a true first person shooter. Doom Resurrection featured impressive art and graphics taken from Doom 3, but limited the player’s movement to event-specific actions. Doom Resurrection was designed with what Carmack perceived at the time to be the iPhone’s limitations. However, experiments with control schemes in Wolfenstein proved that movement and aiming could be handled on the iPhone platform. The control scheme for the new iPhone version of Doom draws heavily from Wolfenstein’s simple FPS controls. Carmack is especially excited to see how people respond to the newly-released Doom Classic for the iPhone. He believes Doom has better default controls than Wolfenstein but he admits he “sort of regret[s] not having a button to go back to Wolfenstein compatibility.” But “you can get 95 percent of the Wolfenstein [control] experience” in Doom, Carmack adds. Doom didn’t take long to develop and in fact was ready to launch much sooner than its early November release date. “I was trying to be responsible. We could have had it out after Wolfenstein Classic,” Carmack said. But while Carmack enjoyed the development phase of Doom, there were still some challenges to confront. Many levels in Doom require players to aim in multiple directional axes since enemies are at varying heights. 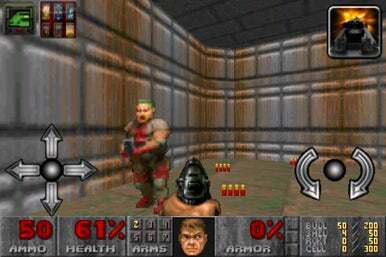 To address this gameplay issue, one of the major differences between Wolfenstein and Doom is the number of instances where the computer helps the player aim. Carmack programmed some instances of auto-aiming and auto targeting to make the gaming experience smoother. The “game is about running around and blasting things,” Carmack says, and so he didn’t want players to be hampered by instances of pinpoint aiming. To Carmack, Doom Classic is about moving around and shooting things; this makes Doom Resurrection’s lack of movement and focus on aiming something of an anomaly for the series. Reviewers and many dedicated fans of the series saw Doom Resurrection as an aberration from the series’ winning formula. Carmack admits that he “kept [Doom Resurrection] pretty tightly constrained” and used a lot of “smoke and mirrors” that improved performance. “We were under the belief that first-person controls wouldn’t work. Tilt controls were playing to the platform’s strengths,” he says. Later time spent developing the Doom port would disprove this belief, and now Carmack feels comfortable doing a Quake port with “two joysticks” if need be. But initially, he couldn’t look to other developers for cues on how to make controls work for the FPS genre. “Everyone would show me 3-D controlled games, and they were universally bad,” he says. Now, the possibility of seeing classic FPS offerings on the iPhone is very real. There are still several titles in Carmack’s back catalogue he’d like to see ported to the iPhone. “Doom II RPG probably is next on the agenda,” he reveals, and after that, Quake would likely get its iPhone port. Ideally, id Software is looking to release ports in chronological order, with one exception. A Rage-themed game built from scratch is also something Carmack would like to see developed to tie-in with the release of the console and computer versions of Rage. Rage, a futuristic first person shooter and racing game to be released on the Mac, PC, and console platforms, has still not been given a set release date. Yet, after it is released, Carmack expects to go back to one of the most storied franchises in gaming history and work on Doom 4.